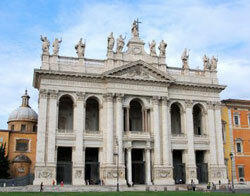 San Giovanni takes its name from the beautiful cathedral found here, San Giovanni in Laterano. The basilica is the official ecclesiastical seat of the Bishop of Rome who is, of course, the Pope. This area is already on the outskirts of the city, but not very far from Centro Storico. The church itself is walking distance from the city's historic centre, though a bit far. It is close to another church, San Clemente, famous not only for its religious art but the archeological sites found beneath it. There is a convenient Metro station close to San Giovanni in Laterano. Near this, Via Sannio has an interesting flea market. A residential complex is being built in this area, along Via Tuscolana.